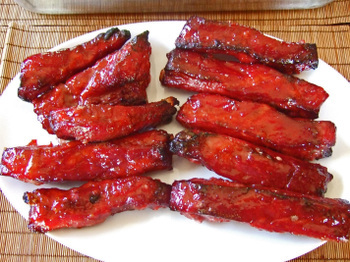 Chinese Style Barbecued Ribs - mmm-yoso!!! How many times have I gone shopping and just threw something in my basket for absolutely no reason at all. Sigh. Of course, eventually you must go home, unload your groceries, and stare at that randomly chosen item, and wonder why you bought it. Buyer's remorse rears its ugly head. Such was the situation with a recent purchase; a rack of St Louis Style Ribs(aka Spareribs), a cut from the lower portion of the of the pig. I cleaned the ribs up a bit, removing the rear membrane, the meat flap(Da Boyz lucked out on this one), though I left the rib tips on. Though I really didn't do a very detailed job like this. And in the end, I still didn't know what the heck I was going to do with these. No smoker at my disposal, and I really wanted to do something "Asian". It's sort of Char Siu-ish, except I used whatever I had on hand(sorry no red bean curd), and I got to play with red food coloring...muah-ha-ha-ha. In retrospect, I could have left the ribs in the oven to caramelize for a few more minutes.....but the smell, oh the smell! You can do without the food coloring.....but there something about the combination of those burnt bits and the red color that sets my stomach off. You may want to bake in foil for several hours before starting the regular cooking to tenderize, but I was too lazy. So here you go...another recipe from you friendly neighborhood hack cook. 1 - Mix the marinade. 4 - Preheat oven to 350. 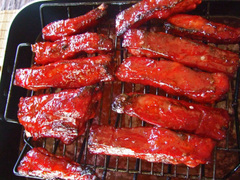 5 - Arrange ribs on a rack above a roasting pan filled halfway with water. 6 - Bake for 40 minutes. 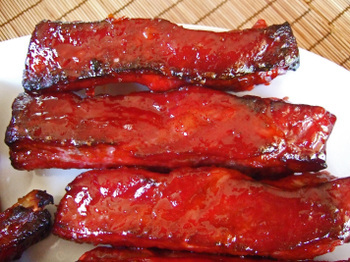 Turn ribs and bake for another 30-40 minutes. Baste w ith remaining marinade after turning. Remember to check your water. 7 - Mix "finishing glaze". I added water because the honey I had was so hard and thick. 8 - Turn oven up to 450. 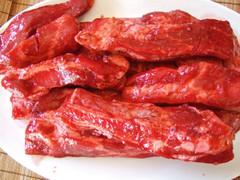 Turn ribs and bake for 10 minutes. 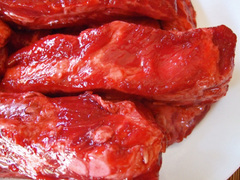 Turn ribs and baste with glaze and bake until desired color is achieved (10-15) more minutes. 9 - Remove ribs from oven and baste with glaze one more time. Serve with rice. It is nice to use the oven, you can have the Big Kahuna reserved for other stuff. 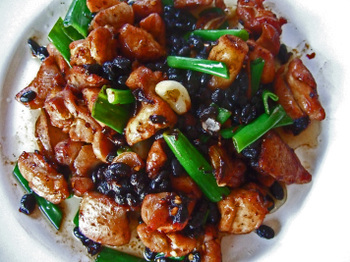 In this case, some nice Black Bean Chicken. And our 30 second green vegetable...that's all the time it takes on the Big Kahuna. 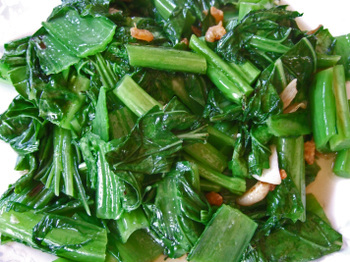 With only salt, slices of garlic, and dried shrimp. High heat does the rest. Wow! That food looks really delici-yos0! I usually do BBQ beef ribs in my crockpot. After 10 hours, they are falling off the bone. Gonna try that recipe. Don't recognize the vegetable, but it looks tasty. Thanks again. Love this blog. Read it every day! Oh man, I am drooling over these :) It doesn't help that my partner is late home with dinner. Ack! you have just made me realise with shock and horror that char siew isn't magically red! I now need to sit down and recover. I've got King's Hawaiian Bread in hand and I'm coming over. Hi Stephen - If you want your ribs really tender, wrap them in foil, and bake for about 2 hours. Then adjust the baking time and temperature. Hi Kat - I love the Japanese Chashu, but it is usually pretty fatty, so I'm not able to eat much of it. Hi Darqrat - I hope you managed to have a nice dinner. Hi Carol - That does sound like a nice combination. Hi Jan - Like i mentioed above; you may want to cook it wrapped in foil for a few hours if you like your ribs more tender. But I liked the flavor/ Let me know how they turned out. Well done. Those ribs look tastey. Kirk, I always forget what an excellent cook you are. The wok hay of your big kahuna and your wok seems to be in perfect working order. I'd love to know if you got a ramen broth soup recipe and whether you use your own chasiu or buy it. Hi Rob - They were pretty good. Hi Jeffrey - The wok does all the work....and quickly. Oil blanching is a wonderful thing! I went ahead and took a stab at these on Saturday. I wrapped them and cooked them for about an hour and a half at 320. Then continued with the glazing steps, but for a reduced time. Our oven is new and so I'm still getting used to it. It think it runs on the hot side. The resulting ribs were a little dry, but tender (the meat fell off the bone, but it wasn't as juicy.) The marinade and glaze were yummy, but my color wasn't as vibrant. If I did this again, I'd lower my oven temp. Thanks for the recipe, it was fun! Hi Jan - Thanks for letting me know how your ribs turned out. It might be worthwhile to buy an oven thermometer - we bought one when we moved in, and know that our oven runs about 25 degrees hot.